We support moms with opioid addictions through therapeutic relationships and not stigma. 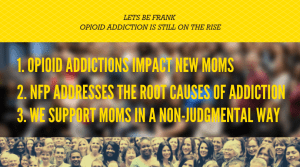 Let’s Be Frank— families harmed by opioid addictions are all around us. Sometimes it’s moms who struggle with this epidemic. Most times we aren’t aware of who around us silently deal with the crisis. A young woman next to me sobbed quietly as we sat in a court room with 42 others about a year ago. We were there on jury duty selection for a Fentanyl-death related case. The judge told us the case involved a drug dealer of the powerful synthetic opioid. The deal went wrong and a young man in his 30s died. The woman who quietly sobbed next to me finally burst into tears. “My fiancé died of overdose last year,” she said. More than 74,000 people died of an opioid-related overdose in 2017. It’s tragic but predictable that the number continues to climb by the thousands. Over the past decade synthetic opioid deaths have doubled past heroin related deaths. Fentanyl is now the deadliest drug in America. I’ve seen the magnitude of the crisis but it’s always difficult to put it in perspective the complexity of the populations affected. No matter how many first responders, state officials, or NFP Nurses I spoke with or how many New York Times Opioid Diaries I watched— it still didn’t bridge the gap of understanding. I finally saw how rampant this devastating crisis had become. Out of the 44 people questioned for jury duty that day at least ten felt the harm of the opioid epidemic. 1 out of 4 people had family members and close friends who died or suffered from opioid addictions. I could hear the emotions of pain and loss surface through their voices as they shared their story. Our selected group of jurors finally spent the next three days reviewing evidence of the drug deal gone wrong. We learned that the dealer suffered from an opioid addiction himself and sold the drugs to his friend— not a stranger. Jurors shared their own stories of addiction in their families as we deliberated. One juror even disclosed that they had recently recovered from an opioid addiction. The last truth is especially important because newborns and children suffer when moms don’t have a supportive network to help them recover from addiction. Many moms are weighed down by burdens of circumstance. Some of those burdens are isolation, abuse, poor health and extreme poverty which can fuel addictions. Every 15 minutes a baby with Neonatal Abstinence Syndrome is born in the U.S. This type of drug withdrawal in newborns is caused when opiates are used during pregnancy. This is a five-fold increase since 2000 and it continues to rise with each passing year. To stop this statistic, moms with opioid addictions need early intervention programs and not stigma. Early prevention is an important approach to deal with this crisis. Interventions like NFP provide a trusted and trained registered nurse to work with the most vulnerable mothers, including those with addiction. Stigma, shame and fear are barriers to recovery, healthcare and stability for moms who use or have opioid addictions. Our nurses break those barriers with their judgement-free approach to help new moms the best parents they can be. Our program has a proven track record of helping to prevent or address health risks resulting from substance abuse, including opioids and heroin, while also demonstrating significant government cost savings. Programs like Nurse-Family Partnership are a part of the long-term proactive solution to the opioid crisis. Read our fact sheet to learn more about how NFP Nurses use their skills to help moms and children affected by substance use. Amanda first found out she was pregnant while unemployed, homeless and on methadone treatment. She eventually connected with NFP nurse Abby through the residential treatment center she stayed in. Her son Ezra was born with Neonatal Abstinence Syndrome because of the methadone she took as treatment for heroin addiction. Amanda wanted to be the best mom she could be and Nurse Abby stayed by her side. She eventually graduated from the program and later applied for an outreach position at NFP. 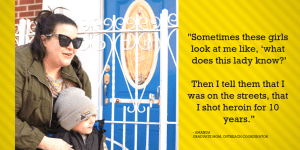 Now she talks to vulnerable first-time moms in churches, community centers, homeless shelters and other facilities around New York. She encourages them to seek help and when they show reluctance, she tells them her story. Since the 1990’s heroin addictions that began with opioid use have increased from 20% to 75%. Women opioid users have increased from 17% to 50% and the age of the first-time heroin use has increased from 16 to 22 years old. This means the population of women who are opioid users and have the potential to get pregnant has increased. Moms are given opioid prescriptions after birth and the rates those they are being refilled is on a dramatic climb. It’s estimated that Medicaid alone will pay over one trillion dollars for treatment over the next 20 years to address this crisis. There is a dire need for effective interventions tailored to protect families since the epidemic shows no signs of slowing. Research conducted by pioneers like our founder Dr. David Olds show the effects opioid use disorder has on parenting, relapse, and neonatal abstinence syndrome. This research proves that this rampant crisis in our communities requires swift action paired with proven solutions for both treatment and education. While new year traditions call for resolutions, here at NFP we will instead renew and strengthen our commitments for good. We commit to support the most vulnerable moms who deal with addictions through an approach that is therapeutic and non-judgmental. We ask you join us in our commitment to support all first-time moms. Help us by sharing Amanda’s story online through social media and amplify her mission of offering our program to more first-time mothers and parents. Help us meet our goal of reaching 100,000 new mothers. If you know a first-time mom under 28 weeks pregnant and is low-income who is interested in a free personal nurse have her call or text us at 884.637.6667. Join our Force for Good.